Definition: Fibromyalgia (FM) is a disorder characterized by chronic widespread pain and a heightened pain response to pressure. Researchers believe that fibromyalgia amplifies painful sensations by affecting the way our brain processes pain signals. 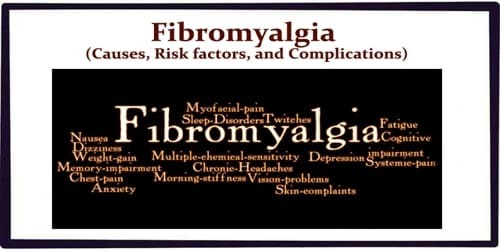 The term “fibromyalgia” is from New Latin fibro-, meaning “fibrous tissues”, Greek μυώ myo-, “muscle”, and Greek άλγος algos, “pain”; thus, the term literally means “muscle and fibrous connective tissue pain”. Symptoms sometimes begin after a physical trauma, surgery, infection or significant psychological stress. In other cases, symptoms gradually accumulate over time with no single triggering event. It is seen as a rheumatic condition, in other words, one that causes soft tissue pain or myofascial pain. 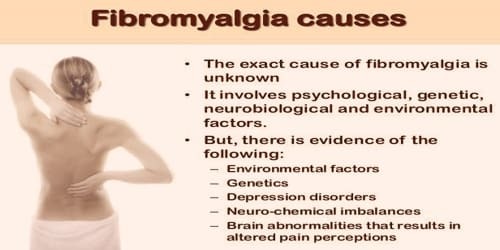 The cause of fibromyalgia is unknown; however, it is believed to involve a combination of genetic and environmental factors, with each playing a substantial role. The condition runs in families and many genes are believed to be involved. Environmental factors may include psychological stress trauma and certain infections. Causes and Risk factors of Fibromyalgia: The cause of fibromyalgia is unknown. However, several hypotheses have been developed including “central sensitization”. The doctors are close to understanding factors that may work together to cause it. Family history: If any people have a family history of the condition, they may be at a greater risk for developing it. Disease: Although fibromyalgia isn’t a form of arthritis, having a rheumatic disease like lupus or rheumatoid arthritis may also increase their risk. Poor sleep is a risk factor for fibromyalgia. In 1975, Moldofsky and colleagues reported the presence of anomalous alpha wave activity (typically associated with arousal states) measured by electroencephalogram (EEG) during non-rapid eye movement sleep of “fibrositis syndrome”. Complications of Fibromyalgia: The pain and lack of sleep associated with fibromyalgia can interfere with our ability to function at home or on the job. The frustration of dealing with an often-misunderstood condition also can result in depression and health-related anxiety.